In Singapore, the People's Action Party politician is a curiously coy creature. Few publicly volunteer to step out to be an election candidate. Even fewer are willing to say that they want to be the country's next prime minister. 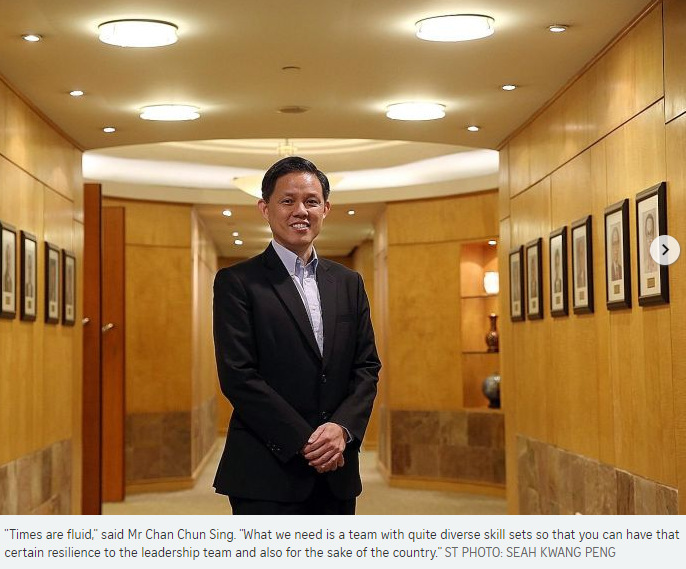 Asked why - and whether this is a necessarily healthy phenomenon, Mr Chan Chun Sing turns the question on this journalist instead: "What kind of people would you like to see leading the country? Would you like a bunch of politicians to be leading the country?" Aren't politicians leading the country? Hardly, says the new Minister for Trade and Industry. He goes on to make the distinction between a "political leader" and "a politician". A political leader, he explains, is prepared to set aside his own agenda to put the country's interests first, take the necessary difficult decisions, and mobilise Singaporeans to overcome challenges together. Whereas a politician, by conventional definition, is "probably just someone who is looking for the expedient option, perhaps for himself". He adds firmly: "I always hope that our country will be led by political leaders and not just politicians. There is a difference." During a recent interview with The Straits Times, Mr Chan neatly turns questions about his status as one of three front runners in the search for Singapore's next prime minister into opportunities to hold forth on the importance of teamwork. Asked what traits he thinks the next prime minister should have, Mr Chan emphasises the collective over the individual. This person should have the ability to bring the team together, understand their respective strengths and weaknesses, and bring out the best in them as a team, he says. "For us, it is not just about having brilliant individuals working in isolation. For us, a core competitive advantage must always be that we can perform well as a team, that we can overlap each other's strengths and weaknesses," he says. Asked if he has these attributes, Mr Chan demurs. "I don't judge myself, and I think it is too early," says the 48-year-old. Some observers reckon the recent Cabinet reshuffle has given Mr Chan an edge, as he will now gain experience handling the country's economic affairs to round out his track record in defence, the social sector and the labour movement. He oversees the Public Service Division as well, and remains deputy chairman of the People's Association. On the chatter, Mr Chan says: "I never think about it in the ways that you described. It is not something that bothers me, it is not something that bothers many of us. I think we are much more focused on where the country is going; the challenges that we are facing now." Does he have someone in mind to lead the fourth-generation of ministers? His response: "Times are fluid. What we need is a team with quite diverse skill sets so that you can have that certain resilience to the leadership team and also for the sake of the country." So what are the qualities that each 4G team member brings to the table? "All of us have our strengths and weaknesses, so depending on the circumstances, depending on situations, we all play different roles," he says. "I don't publicly comment on my peers nor my own strengths or weaknesses. I am not from that generation," he adds, laughing. Mr Chan is more open, however, with his praise for Mr Lim Hng Kiang, his predecessor who helmed the Trade and Industry Ministry (MTI) for 14 years. "Hng Kiang brings with him many years of experience, a network of relationships that we can leverage on. That is why I requested for him to stay back as a special adviser, because that provides that continuity, that depth of experience that we always have," Mr Chan says. The work at MTI is long-term in nature, be it policies or external trade relationships, he says. Continuity gives certainty and confidence to the business community, and builds on Singapore's reputation as a steady pair of hands. "We don't chop and change in the sense that just because one person comes in, then everything goes orthogonal or 180 degrees different." Meanwhile, having former minister for trade and industry (industry) S. Iswaran take charge of trade relations is part of leveraging on his strengths, he adds. He points to Mr Iswaran's deep relationships with India and South Asia, and says it would be to Singapore's advantage to continue to tap his experience and relationship network in that region. Mr Chan takes over MTI at a time of disruption, with free trade under pressure from protectionist sentiments and brewing trade tensions between the world's two major powers - the United States and China. There are two types of challenges Singapore must navigate, he says. The first is the external global trading environment. "We have to watch the trends very carefully and make sure that we continue to maintain our relevance in that shifting geopolitical space." The second challenge, he says, is ensuring that industries and companies here remain competitive. MTI has rolled out 23 Industry Transformation Maps - sector-specific plans to help companies adapt to changes and "stay ahead of the game". Besides evolving their business models and adopting new technologies, companies must also seek out new markets for their products and services, Mr Chan adds. The fundamental challenge facing Singapore now is not very different from what was faced in 1965, he says. "How do we as a small city-state transcend our geographical size, our finite resource constraints, how do we transcend our geographical space." Where Singapore had relied on its airport and sea ports to connect to the world, it now has to do so in the non-physical realms of data, finance, talent and technology. "If we can do this successfully, we have what we call Singapore Unlimited - unlimited by our geography and unlimited by our size because we are reaching out, connecting to the rest of the world as our hinterland," Mr Chan says. The narrative of Singapore as a small island state that has to transcend size and resource constraints to defy the odds of history and thrive is one that he keeps returning to during the hour-long interview. Singapore's existential challenges are a favourite theme of Mr Chan's. In speeches and dialogues at many past events over the years, he has evoked it again and again. Asked why he feels the need to reiterate Singapore's lack of a conventional hinterland, he highlights the need to be "very realistic with our own situation". "We must be alert and alive to the challenges but not afraid. At the same time, we must have aspirations of what we can do for ourselves and our future," he says. Singapore can turn its constraints into opportunities, he says. This was something Mr Chan first spoke of in 2011. Then, the former army chief was introduced as a new PAP candidate at a party event to unveil the manifesto for the general election that year. In a speech, he noted that states of Singapore's size have rarely survived beyond 100 years. He then asked the audience to "kee chiu" (raise one's hand, in Hokkien) on how long they could see Singapore surviving. That phrase has stuck with Mr Chan since, with some netizens using it to deride his informal speech and mannerisms. Today, he is unfazed when asked about the incident, and whether he has since sought to modify his public-speaking persona in response to the criticisms. He replies: "One's ability to connect depends on context. If you extrapolate that, then you do injustice to the situation and the person. "I don't think there is a particular style that defines my approach," he adds. "It all depends on the occasion, it all depends on the audience." For example, he would adopt a more serious and formal manner when talking to company chief executives, compared with unionists or grassroots leaders. "It is whether you are versatile enough to engage," he says. "Your style is different because you want to appeal to the audience and you want to relate. Style you can change, style you can adapt, but your message must be consistent." Within the PAP itself, Mr Chan plays a key role as its organising secretary, helping the party prepare for the next general election. But how sweet is the ground? Since it won the 2015 election resoundingly with a 69.9 per cent vote share, the PAP has drawn fire for some moves, including amending the Constitution to reserve the 2017 presidential election for Malay candidates and announcing a goods and services tax hike that will kick in some time during the next decade. Mr Chan returns to his thesis on what makes for a political leader. "Do you believe what you are doing is good for the country in the long haul?" he asks rhetorically. "If you have enough conviction to say that this is good for the country, this is necessary for the country, then as leaders it is our job to go out and convince people, as many as we can."